Aaron spit-up like nobody's business (which we learned at 3 months old was because he had a milk protein intolerance), so burp cloths were HUGE. The cloth diaper variety are a must-have. 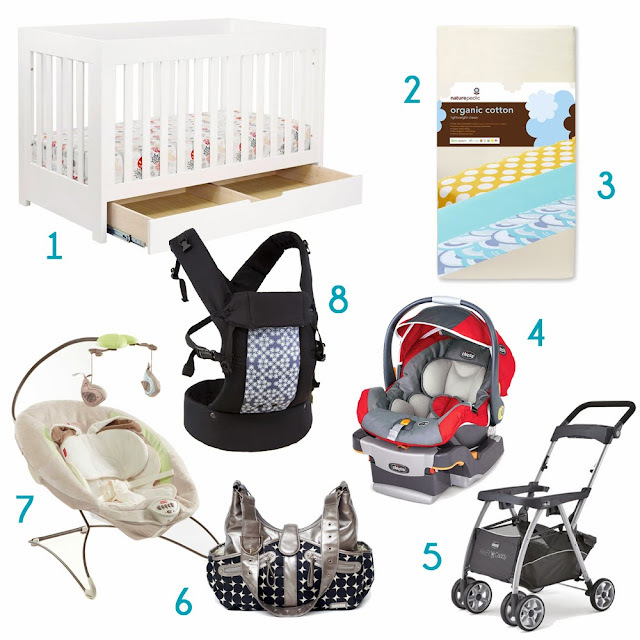 Two other "must haves" for me that were not on your list were the rock-n-play and the boppy pillow. The boppy has so many more uses than just a feeding pillow! Yes to everything you said! Our baby also spits up like crazy (she has acid reflux, and even on meds she spits up, though less than before), so we have tons of receiving blankets that we use as burp cloths. Yes, the boppy is awesome as well, I forgot to mention it. We don't have a rock-n-play but I sure wish I had it in those first few weeks. looks like you did a lot of research on all the baby items. We did most of things by trial and error...:) spending sometimes more than we wanted...-A.
Yeah, research is my middle name. :) Though I also think that despite all the research, we spent more than I anticipated. I love the Beco Gemini! Actually, I love the Moby too, but Owen loves the Beco way more. I also love the Chico car seat. Other things we couldn't live without - Aden&Anais swaddle blankets and our Mamaroo. Yes, we also couldn't live without swaddle blankets for the first eight weeks or so! Such a life saver when it comes to putting the newborn baby to sleep. We just recently caved and got the Beco Gemini as well. It is as comfortable as our Ergo and allows front facing carry, which Rubin prefers. Wish I'd found this one earlier. Our favorite recent acquisition is Edushape foam floor puzzle tiles - you can arrange them however you like to make a foam playing surface. It's much nicer for Rubin's head than our hardwood and tile. He loves crawling around all the bright colors, and they are so easy to transport and set up a play area anywhere. I think your sister is right, I've seen lots of moms wear their newborn babies in wrap-style carriers. I hope you find the swaddle blankets useful!